1. Tear off six pieces of foil 8 inches wide each. Preheat the oven to 350F. 2. In a small bowl, whisk together the broth, tomato paste, oil, vinegar and garlic. In a large bowl, combine the wheat gluten, chickpea flour, nutritional yeast, paprika, chili flakes, oregano, cumin, coriander, salt and pepper and form a well in the center. Pour the liquid ingredients into the well and stir with a rubber spatula until the dough leaves the side of the bowl. Knead the dough for 3 minutes to develop the gluten. Let the dough rest for 10 minutes. Knead again for 2 minutes. 3. Divide the dough into 6 equal pieces. Place a piece on each piece of foil and shape it into a log 6 inches long. Wrap the log on its long axis first, then twist the edges the keep everything inside. Wrap firmly but not too tight (apparently these can explode while baking!). Repeat for all pieces. 4. Place each directly on the middle rack in the oven and bake for 40 minutes. Cool for 40 minutes before using, or overnight for best results. Can keep refrigerated for 2 weeks or be frozen. Fantastic, Saveur! I missed chorizo when I first gave up pork. This is a great recipe to have your sausage and eat it, too. Thank you for your snappy contribution to WHB! It looks great. I share your views about eating vegan, and probably eat vegan food about 70% of the time. I have made seitan sausages, but it is so difficult to get VWG in the UK. Expensive mail order only. these are amazing Janet! you got such great flavored infused into them. I’ve actually never dealt much with chorizo either but they sound good to me! 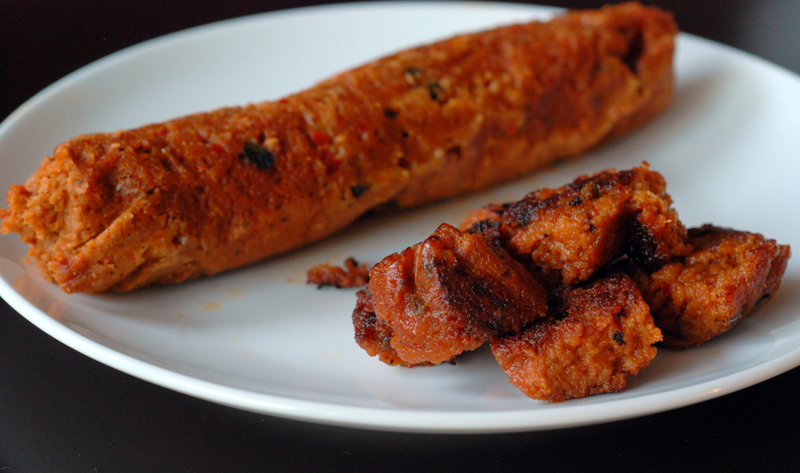 I’ve been meaning to work with seitan…perhaps I’ll give these a try! Do you think I could replace the wheat gluten by something else? regular wheat flour? Seitan? I don’t really think the wheat gluten can be substituted unfortunately. But I think seitan is the same things as wheat gluten if you have that. had bookmarked Stella’s recipe, too. Thanks again. 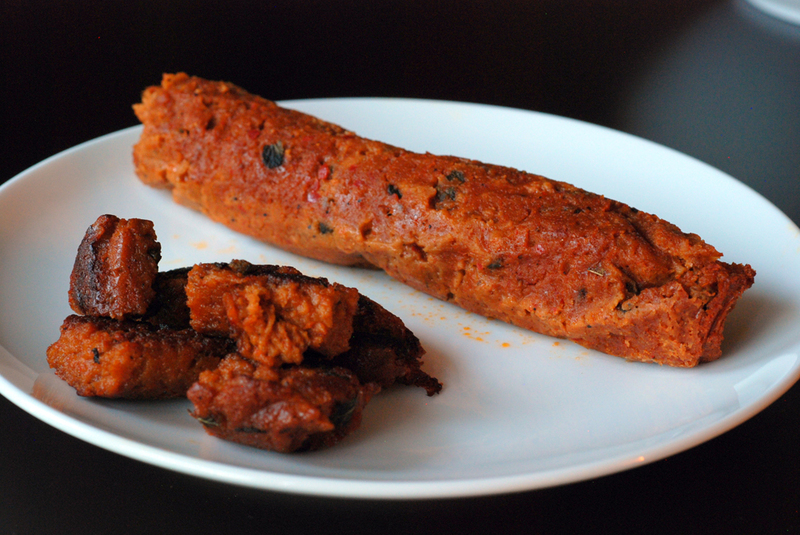 Vegan sausages would be something for us to try for Meatless Mondays. They look delish Janet. I loooooove homemade seitan fake meat things like this. These look awesome and I will definitely try them! Would you recommend Viva Vegan? I haven’t heard much about it. do you think i could substitute a can of mashed beans instead of the wheat gluten? I don’t think it would work as a 1:1 substitution. The VWG is used as a binder and keep things elastic. I’ve never heard of Aleppo pepper. Where can I find that and are there any possible close substitues in case I don’t find it? Aleppo pepper is not necessary for this dish. Pick your favourite spicy chili flake. I find Aleppo has a milder flavour which is why I like it. You can usually find it in middle eastern grocers or specialty spice stores like Penzeys. Hope this helps. Question about the nutritional yeast – did you use powdered or plakes?